Goku is back and stronger than ever with the Dragon Ball Z Spirit Bomb Energy Drink. 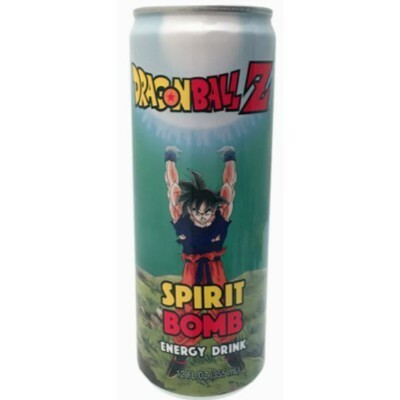 The perfect thirst quencher for any 90s kid, each can displays young Goku art and contains a powerfully fruity energy soda that’ll give you the caffeine jolt you need to protect the earth from annoying alien invaders. Water, high fructose corn syrup, acidity regulator E330, acidity regulator E331, taurine, natural flavor, caffeine, preservative E202, preservative E212, ginseng root extract, guarana seed extract, inositol, vitamins B3-B5-B6-B12, thickening agent E414, emulsifier E445, colors E129*-E133. Not recommended for children or people sensitive to caffeine or pregnant or nursing women. *May have an adverse effect on activity and attention in children. Contains GMO. Nutrition facts (for 100ml): calories 45Kcal, total fat 0g (saturated fat 0g), total carbohydrate 11.5g (sugar 11.3g), protein 0g, salt 0.1g.